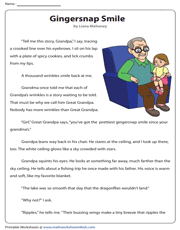 Introduce children to a greater range of literary devices and various genres such as articles, stories and poems with this collection of printable reading comprehension worksheets designed for grade 5. Other aspects of interest include elaborate questions in finding reasons or evidence to support an argument, letter-sound correspondence, syllabication and morphology. Also, children should be able to read at a good rate and with an expression good for a fifth grader. Steeped in history, New York is a key player in the economic and cultural arenas of America. This grade 5 comprehension worksheet contains questions on domain-specific words and degrees of comparison. 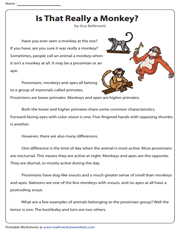 Do you know the difference between a monkey, an ape and a prosimian? Comprehend the similarities and differences, and classify the primates. Also, answer questions based on the non-fictional text. A timely unexpected help can be a game changer! 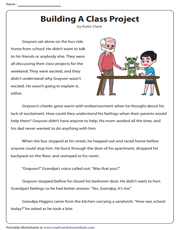 Read on to find out how Grandpa's help changes Grayson's attitude. 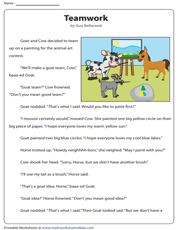 In this PDF printable, grade 5 children learn the difference between similes and metaphors and much more. "Alone we can do so little, together we can do so much." The fable is build around the theme - teamwork. Familiarize 5th-grade children with the two genres of stories, compare and contrast between characters and more. Caves are more than just dark holes in the ground. 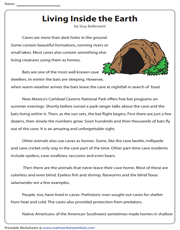 Learn about cave-dwelling creatures with this reading worksheet. Test comprehension with exercises based on minute details and understand the writer's purpose as well. Get ready to beach comb with this non-fiction reading comprehension. From polished gems to shark teeth, there are countless ocean treasures. Children respond to the follow-up exercises based on the text and build vocabulary too. With clowns, acrobats and glittering costumes, the circus is a grand affair. 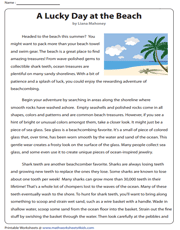 This exciting 5th-grade reading worksheet tests the skills of children in comprehending and reflecting on the characters and finding specific details in the passages. Breezes are a real treat, and they send sweet scents around. 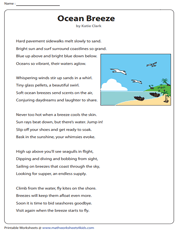 Let your child step up his poetic sense and explore a few literary devices such as alliterations and personifications with this printable grade 5 poem comprehension. The smile is the child's curiosity, and the wrinkles are Grandpa's wisdom. 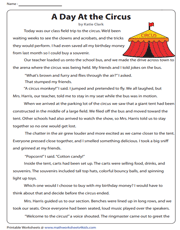 This grade 5 reading comprehension is a breath of fresh air as it helps describe a scene and compare and contrast the thematic elements of the story. 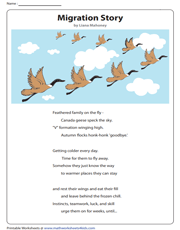 The poet paints a beautiful picture of how Canada geese migrate to a warmer place. This informational text is followed by questions in literary devices and understanding quatrains and rhyme schemes. 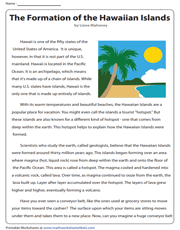 Get a vivid picture of how the Hawaiian islands are formed. In this comprehension passage, children answer how a word has two distinct meanings when used in different contexts and also attempt some text-based questions.